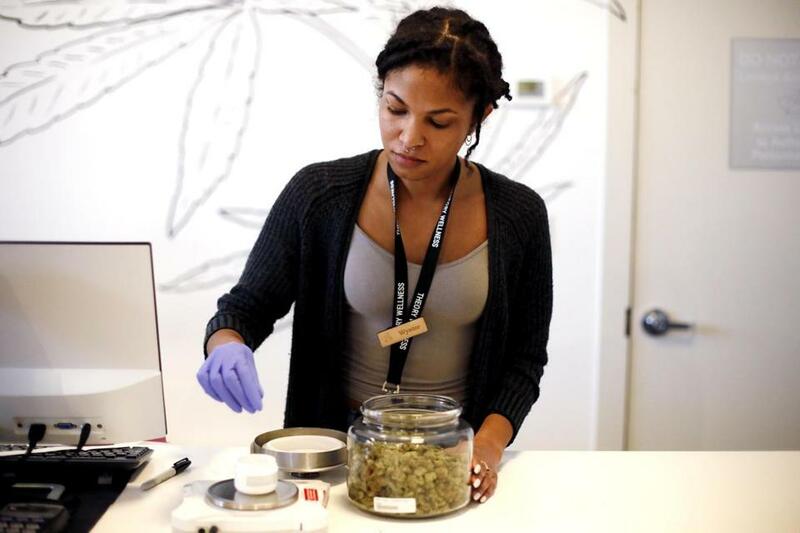 Wynter Durant measures out an order for a medical marijuana patient trying to beat the lines at Theory Wellness before Friday&apos;s opening day for adult-use recreational marijuana in Great Barrington on Jan. 10. Experts now distinguish between the “new cannabis” — legal, highly potent, available in tabs, edibles, and vapes — and the old version, a far milder weed passed around in joints. Levels of THC, the chemical that produces marijuana’s high, have been rising for at least three decades, and it’s now possible in some states to buy vape cartridges containing little but the active ingredient. The concern is focused largely on the link between heavy usage and psychosis in young people. Doctors first suspected a link some 70 years ago, and the evidence has only accumulated since then. In a coming book, “Tell Your Children,” Alex Berenson, a former New York Times reporter, argues that legalization is putting a generation at higher risk of schizophrenia and other psychotic syndromes. Critics, including leading researchers, have called the argument overblown and unfaithful to the science. Yes, but so can overuse of caffeine, nicotine, alcohol, stimulants, and hallucinogens. Psychosis is a symptom: a temporary disorientation that resembles a waking dream, with odd, imagined sights and sounds, often accompanied by paranoia or an ominous sensation. The vast majority of people who have this kind of psychotic experience do not go on to develop schizophrenia, which is characterized by episodes of psychosis that recur for years, as well as cognitive problems and social withdrawal. “I’ve been doing this research for 25 years, and it’s polarizing even among academics,” said Margaret Haney, a professor of neurobiology at Columbia University Medical Center. Consider cigarettes, the least mind-altering of these substances. In a 2015 study, a team led by Dr. Kenneth S. Kendler of Virginia Commonwealth University analyzed medical data on nearly 2 million people in Sweden. The data followed the individuals over time, from young adulthood, when most schizophrenia diagnoses occur, to middle age. Smoking was a predictor for later development of the disorder, and in what doctors call a dose-response relationship: The more a person smoked, the higher the risk. Yes. Brain scientists know very little about the underlying biology of psychotic conditions, other than that hundreds of common gene variants are most likely involved. Schizophrenia, for instance, is not a uniform disorder but an umbrella term for an array of unexplained problems involving recurrent psychosis and other common symptoms. The region is rich with CB1 receptors, which are involved in the pruning, and are engaged by cannabis use. And alterations to the pruning process may well increase schizophrenia risk, according to recent research at the Broad Institute of MIT and Harvard. In a 2016 analysis, scientists there found that people with the disorder often have a gene variant that appears to accelerate the pruning process. Psychotic conditions tend to run in families, which suggests there is an inherited genetic vulnerability. Indeed, according to some studies, people prone to or at heightened risk of psychosis seem to experience the effects of cannabis differently than peers without such a history. The users experience a more vivid high, but they also are more likely to experience psychosislike effects such as paranoia. The evidence so far indicates that one’s familial risk for psychotic disorders outweighs any added effect of cannabis use. In a 2014 study, a team led by Ashley C. Proal and Dr. Lynn E. DeLisi of Harvard Medical School recruited cannabis users with and without a family history of schizophrenia, as well as nonusers with and without such a history. The researchers made sure the cannabis users did not use other drugs in addition, a factor that muddied earlier studies. The result: There was a heightened schizophrenia risk among people with a family history, regardless of cannabis use. Because marijuana has been illegal for so long, research that could settle the question has been sorely lacking, although that has begun to change. The National Institutes of Health have begun a $300 million project that will track thousands of children from the age of 9 or 10 through adolescence, and might help clarify causation. For the near future, expert opinions will most likely be mixed. “Usually it is the research types who are doing ‘the sky is falling’ bit, but here it is switched,” said Dr. Jay Geidd, a professor of psychiatry at the University of California, San Diego. “The researchers are wary of overselling the dangers, as was clearly done in the past. However, clinicians overwhelmingly endorse seeing many more adolescents with ‘paranoia’ ” of some kind.